GET READY TO RUN! The IT book of the early 2000s with the original cast is back – Nico! Karolina! Molly! Chase! Old Lace! And, could it be? GERT?! 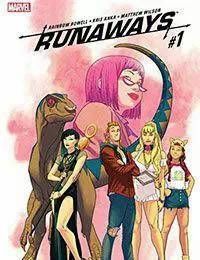 The heart of the Runaways died years ago, but you wont believe how she returns! Superstar author Rainbow Rowell (Eleanor &amp; Park, Carry On) makes her Marvel debut with fan-favorite artist Kris Anka (ALL-NEW X-MEN, CAPTAIN MARVEL) in the series that will shock you and break your heart!